Discuss the possibility of catastrophes occurring in your country and their likely effects. Buildings tend to/ are likely to collapse during an earthquake if their structural frames are not braced to resist the force of earthquakes. What observations do you think you could make about build­ings in the above countries? Example: During a hailstorm in Iran, the roof of a light structure was penetrated because the roof covering had not been made hail resistant. Example: Roofs of light structures in Iran are likely to be penetrated during a hailstorm if they are not hail resistant. The gravitational force on a structure can be divided into dead loads and live loads. Dead loads can be calculated accurately because they rarely change with time and are usually fixed in one place. Live loads are always variable and movable, so no exact figures can be calculated for these forces. Structures must also resist other types of forces, such as wind or earthquakes, which are extremely variable. It is impossible to pre­dict accurately the magnitude of all the forces that act on a structure during its life; we can only predict from past experience the prob­able magnitude and frequency of the loads. Engineers never design a structure so that the applied loads exact­ly equal the strength of the structure. This condition is too danger­ous because we can never know the exact value of either the applied loads or the strength of the structure. Therefore, a number called a 'factor of safety' is used. The safety factor is defined as the ratio of the probable strength of the structure and the probable loads on the structure. This factor may range from 1-1 (where there is little un­certainty) to perhaps 5 or 10 (where there is great uncertainty). 1. Can the loads from the internal partitions of a building be estimated accurately? Why? 2. Can the loads from storage in a building be estimated accurately? Why not? 3. How can an engineer predict the possible loads that will occur on a structure? 4. Why do engineers never design a structure so that the applied loads exactly equal the strength of the structure? 5. When there is great uncertainty about the loads on a structure and the strength of a structure, does an engineer choose a high or low safety factor? 6. When does failure occur? 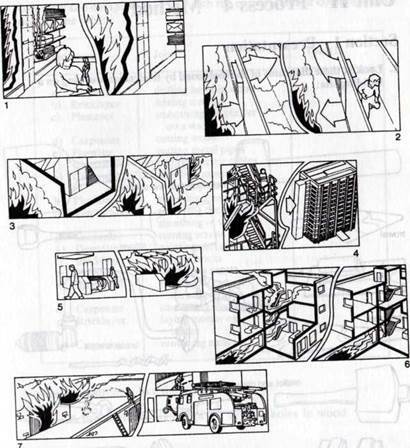 Each pair of drawings shows a design mistake which could be dangerous, and a way of reducing the danger.